MW 4Couple is a beautiful Magento theme which is ideal for any products used by couple such as T-shirt, shoes or any other apparels. They currently includes 3 colored skins. This is a simple, clean looking theme design. You can choose 3 different colors for the header, the showroom is in the right of the homepage, the widget sidebars in the left of homepage are great for offering your visitors a little something extra. 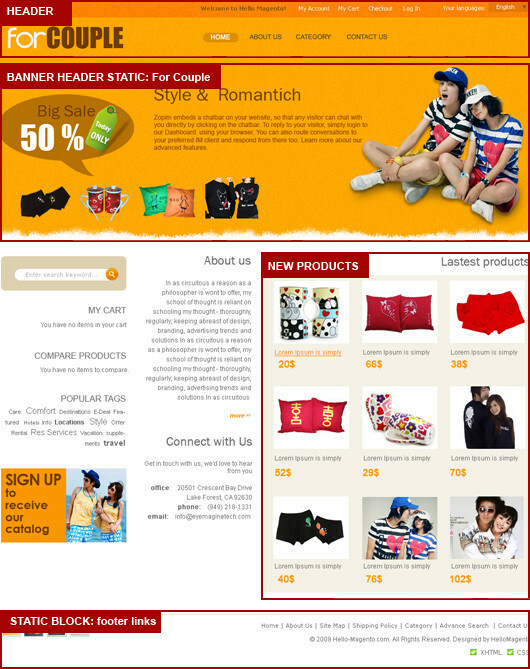 If you want to buy great things for your lover or any persons you like, shops using this theme are a good choice. Plus with that, this theme is HTML & CSS validated carefully by our experienced experts. More importantly, MW 4Couple is fully compatible with all Magento versions. Also, it is very easy to install, easy to use and edit. Allow: You have full permission to use or customize this theme for personal website or for your client website. This theme uses Easy Banner extension.